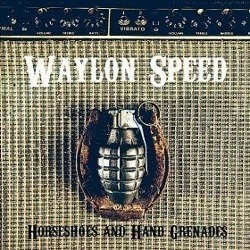 It's tempting to describe Waylon Speed just in terms of their influences but such analysis doesn't do justice to the irascible spirit in this music, a genuine passion that courses equally vigorously through both halves of this package. And while this band might not want to admit it, there are more than a few moments during the course of Horseshoes and Hand Grenades that are as reminiscent of contemporary country forbears The Eagles and cowpunkers The Long Ryders, not to mention, during the course of "Amplifier Switches" or "Santa Rose," Neil Young & Crazy Horse in their earliest days. The quartet express themselves with just about as much eloquence unencumbered by lyrics so it's within the few seconds of the "Intro" to Hand Grenades, before guitar chords cascade from "Lassiter" that it occurs to wonder how much of this instrumental content might've been interwoven within the preceding baker's dozen songs. Of course, the album might more closely resemble one of those ponderous prog rock concept albums and if there's one influence Waylon Speed don't share it's any debt to Yes or Emerson Lake &Palmer: read the titles to these tunes and know these guys are cowboys not dandies-- "Shadows on the Sage," "Under the Cottonwoods." "Deception Pass" sounds out of place as an outtake from the companion piece to this otherwise all instrumental set which suggests Waylon Speed must've listened to more than a little of The Minutemen or The Dead Kennedys when cutting their teeth as a unit. Clearly, they're not averse to throwing anything that occurs to them into the mix, and in addition, the tongue in cheek aspect of their name weaves in and out of the music on this double cd set: the clarity in the sound of two electric guitars, bass and drums might overshadow the pensive lyrics of tunes like "Bent Carousel" or the title song were it not for the prominence of the vocals that contain a drawl as long as the twang of the guitars is loud. To say Waylon Speed wear their collective heart on their sleeve makes them sound more sensitive than (perhaps) they really are, but there's also a defensive side to them that recalls the outlaw country movement of the Seventies spearheaded by Willie Nelson and Waylon Jennings. And by the time "The Minor Blues" begins, in all its ominous glory, the heavy rock more obviously influenced by British bands of the late Sixties reveals, in turn, something of a Lynyrd Skynyrd connection; oddly, this iconoclasm only makes them more lovable, the listener willing to forgive the open-faced statement "I sold my soul for rock and roll"(surely they know there's a Black Sabbath record by that name?!) if only because it's balanced by lines like this from "Street Lights": "I look in the mirror and get real sick." If the music weren't so edgy, it wouldn't so accurately reflect the prolific nature of Waylon Speed. The double set comes just about twelve months after their debut and they've already recorded another EP of a handful of new compositions. Ultimately it's less productive to analyze this music than just feel it because that puts you on the same frequency as these young musicians.